The London side are just five points adrift of Premier League leaders, Manchester City, after today’s 1-0 victory. Eriksen scored his second goal in as many games for Tottenham this afternoon. 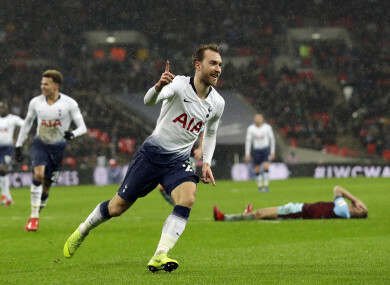 CHRISTIAN ERIKSEN CAME off the bench to score the stoppage-time goal that earned Mauricio Pochettino his 100th Premier League victory as Tottenham manager in a hard fought 1-0 win over Burnley. The struggling Clarets had been seconds away from leaving Wembley with a precious point against hosts who had clinched qualification for the last 16 of the Champions League by drawing 1-1 at Barcelona in midweek. Now, Spurs can look forward to Monday’s last 16 draw in the knowledge that third place in the Premier League table will still be theirs whatever top-four rivals Chelsea and Arsenal do on Sunday. It was perhaps inevitable that Pochettino would make changes to the starting line up, especially as centre-back Jan Vertonghen was ruled out by a thigh problem and Eric Dier was unavailable because of a virus. Oliver Skipp was the chief beneficiary, with the 18-year-old midfielder handed a first Premier League start after a couple of cameos off the bench. Yet, the feel-good factor from a famous night at the Camp Nou on Tuesday wasn’t in evidence in the stands with vast swaths of empty seats as patience over the wait for the club’s new stadium seems to be running out. Burnley were buoyed by last week’s 1-0 win over Brighton, which ended a barren run that had seen them add just one point from a possible 21. The visitors had the best chance of a lacklustre first-half when Hugo Lloris’s misplaced clearance went straight to Phil Bardsley, who teed up Ashley Barnes to head wastefully over the bar. Burnley almost broke the deadlock three minutes into the second half from a free-kick move when ex-Spurs winger Aaron Lennon’s cross was met on the volley by Barnes only for a combination of Toby Alderweireld and Harry Kane to block. Joe Hart has rediscovered some of his best form since joining Burnley in the summer after a few lean years out on loan from Manchester City. The former England number one produced a top-quality stop to deny Erik Lamela from Danny Rose’s cross. Skipp, Tottenham’s fourth-youngest ever Premier League starter, was replaced by Heung-min Son for the last 15 minutes, with centre forward Fernando Llorente soon coming on for Lamela. The newcomers fashioned a clear chance when Llorente chested Kieran Trippier’s cross into the South Korean’s path only for Son to fire across goal and wide. Dele Alli also scuffed wide at the back post as the pressure built. It finally paid off when Kane held the ball up and played Eriksen in for a finish high into the net to leave Spurs just five points off the top of the table. Email “Eriksen strikes late to hand Spurs victory over stubborn Burnley”. Feedback on “Eriksen strikes late to hand Spurs victory over stubborn Burnley”.